Phononic Crystals (PCs) (i.e. periodic arrangements of several materials) have received a great deal of interest for the last two decades because of the unusual properties that they can exhibit. Classically, depending on material properties and geometrical arrangement, PCs can produce band gaps, i.e. frequency ranges where the propagation of waves is forbidden (i.e. waves are evanescent). 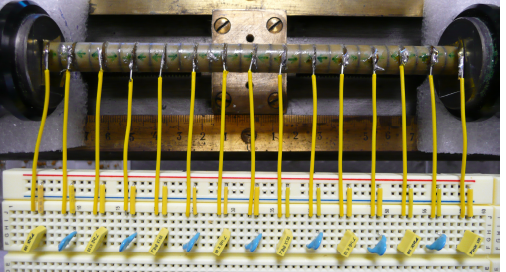 These Bragg band gaps offer several potential applications such as sonic insulators or filters, from the kHz to the GHz range depending upon the spatial periodicity. Another way of shaping matter in order to obtain unusual properties for elastic waves is by integrating small size resonators as in Acoustics Metamaterials (MMs). Our approach consists in developing PCs and MMs made partially or totally of piezoelectric material in order to take advantage of their high electromechanical coupling for controlling electrically elastic wave dispersion and subsequent properties. The starting point of this research is the discovery of a new kind of band gap for elastic waves solely due to periodic electric boundary condition (EBCs) in a stack of piezoelectric plates or rods separated by thin electrodes. The following devices exhibit Bragg gaps that depend on the electrical boundary conditions chosen on periodically placed electrodes. Depending on the electrical boundary condition, tunability is clearly demonstrated, i.e. an increase or a decrease of the width and the position of the stop bands. 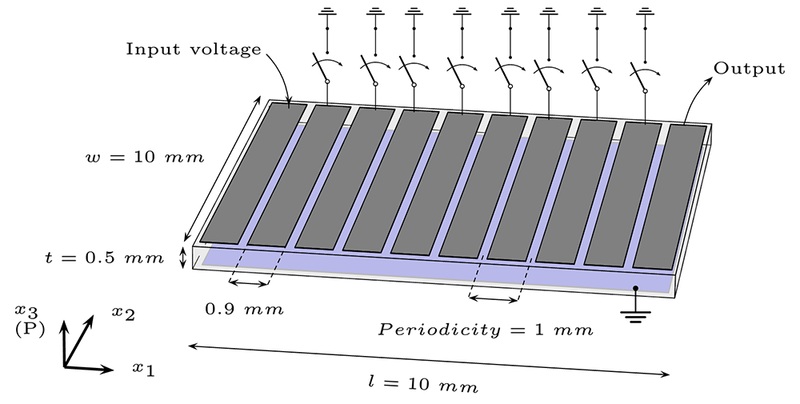 stack of piezoelectric rods or plates, poled along their thickness [S. Degraeve et al, J. Appl. Phys. 115, 194508 (2014)]. More complex control involving space-time modulation of electrical boundary conditions give access to tuning/control of nonlinear physical effects such as non reciprocity [C. Croenne et al, Appl. Phys. Lett. 110(6), 061901 (2017)]. Space-time modulation of EBCs may be realized using electronic components such as transistor-based switches or variables capacitors. The interaction of an elastic wave with a piezoelectric stack having a periodic subset of grounded electrodes spatially shifted at constant speed, provides several interesting nonlinear phenomena: intermodulation effects analogous to Brillouin scattering effect; nonreciprocal transmission in a frequency range tuned by the speed of EBCs; instable regime at subsonic and supersonic speed. Piezoelectric stack with grounded electrodes “moving” at constant speed: (a) transmission coefficient at fundamental frequency through a finite stack (numerical simulation) showing the non-reciprocity; (b) Fundamental frequency transmission coefficient as a function of the fundamental frequency (f0) and the grounded electrode shift velocity (v). Light and dark gray solid lines show the apparent modification of the dispersion branches frequency boundaries at the X and Γ points, respectively. 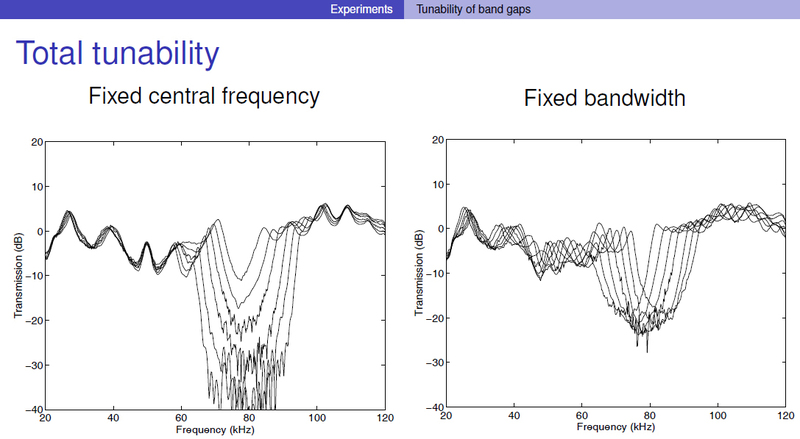 The electric charge Bragg band gap originally between 129 and 192 kHz is shifted depending on the shift direction, which is a direct signature of the non-reciprocity effect. Our research activities in underwater acoustics are focused on acoustic discretion and stealth of ships. They are based on a broad spectrum of expertise: numerical simulation tools, design, technological fabrication and experimental characterizations. Structured panels integrating PCs and MMs have been evaluated as acoustic coatings for marine systems applications, in particular for the reduction of radiated noise in water. In P. Méresse PhD thesis, new concepts of acoustic panels with different lattices of macro-inclusions have been simulated, fabricated and tested in the IEMN-ISEN tank facilities [P. Meresse et al, CR Mecanique 343(12) 645 (2015)]. In the field of underwater acoustic discretion and stealth, a particular issue is related to the noise radiation or acoustic diffraction from periodically stiffened metallic structures. The purpose is to reduce significantly the bright spots issued from stiffener periodicity and associated to Bragg diffraction and Bloch-Floquet waves radiation. In FARAON ANR Astrid project (Acoustic stealth by resonating stiffeners, 2014-2016), mechanical resonators are placed on the stiffeners to jam the acoustic pattern associated to acoustic diffraction. The work is going on this topic in the frame of the RAMSES ANR Astrid project (2017-2020) where the concept will be implemented in realistic configurations in line with naval concerns. Numerical stealth diagram. Left: plate with only stiffeners, right: plate with additional resonators on the stiffeners. Auditory displays represent data via the auditory channel: Listening to the data potentially unveils some aspects that were not visible, and promises new approaches and insights into the data. Our approach of auditory display is to 1) develop user-centered auditory display methods (systematic user evaluation, design and development made with the users), and 2) include audio spatialization techniques in the design, in order to take advantage of situations of augmented perception allowed by virtual reality environments. This topic is at the crossroad between acoustics, psychology, and linguistics. The challenges we are interested in are: a) integrate in the sound perception field the recent research results showing that perception is multimodal and always involves several sensory modalities that interact in a complex way, b) go beyond the fact that sound perception experiments are very often held in laboratory conditions, where the participants are put in a non-realistic, artificial situation.